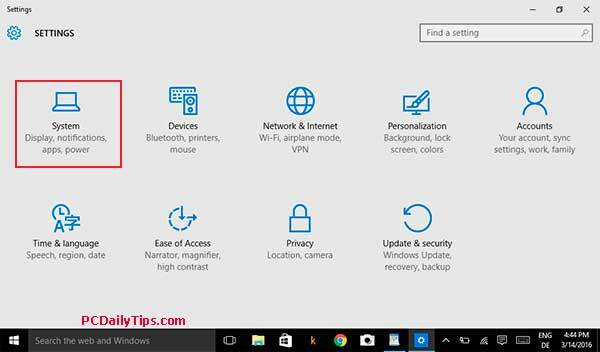 Using Windows 10 on a tablet device is almost like using your Windows laptop, and it has more features. 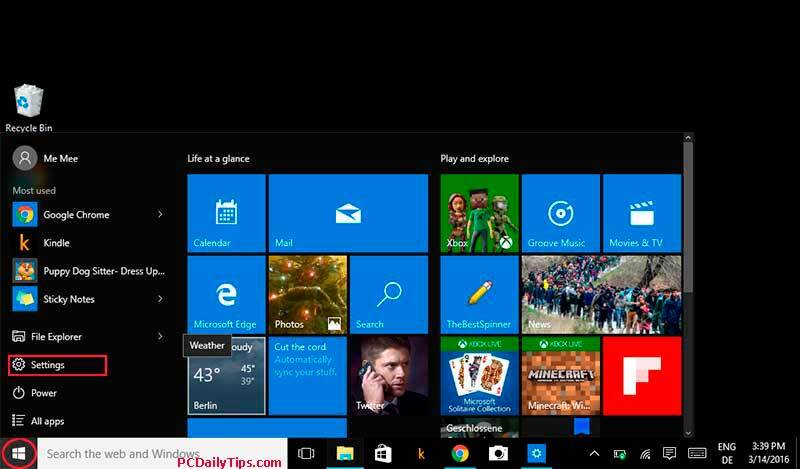 Windows 10 or 8 to me, was built for tablet or standard conventional devices. For this, they enable us to use two styles of interfaces, one for a mobile device environment, and the other is, is an environment that you are used to, which is desktop mode in Windows 10 or 8. There are also some cases, where, for example, you want to install an app or a program, and they will ask you to switch to desktop mode. Or you want to use the desktop mode, because you are more fond to the conventional Windows look than a mobile or tablet style. When you are new to touchscreen devices that has Win 10 OS on it, you will learn these features day by day, I find them very fascinating. One of those additional features are the ability to switch from Tablet looks to usual desktop mode, vice and versa. These two environment appearances, will show you the difference between the two looks modes. 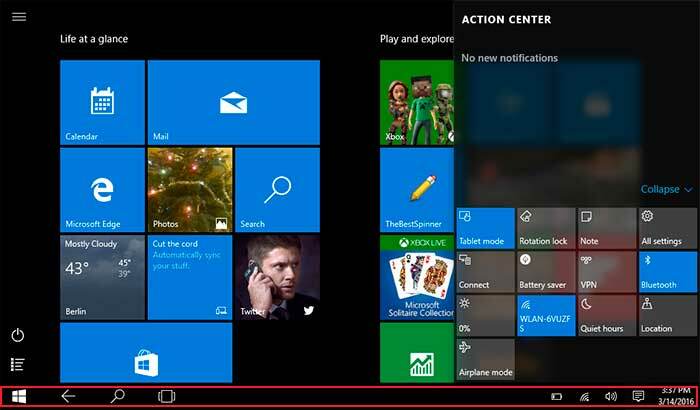 Pay attention on the start screen and task bar on the bottom of the screen, they do look different. Desktop mode Windows 10, no start screen. 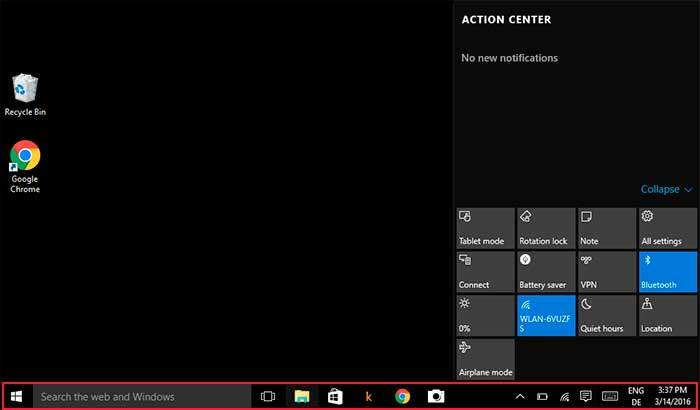 Here is the most easiest method to do switch your Windows tablet mode to standard Win 10 Desktop mode. See Crocotips tutorial, if you use Windows 8. On your screen, you will see a “Action Center icon” usually in the very right corner bottom of your screen, click that, and you will see many settings that you can change, including the “Tablet mode” setting. 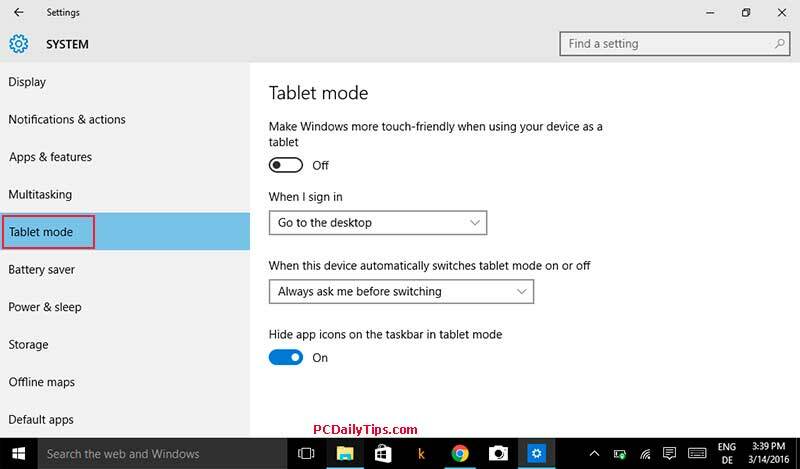 Toggling it on and off will let you have Tablet or desktop mode. 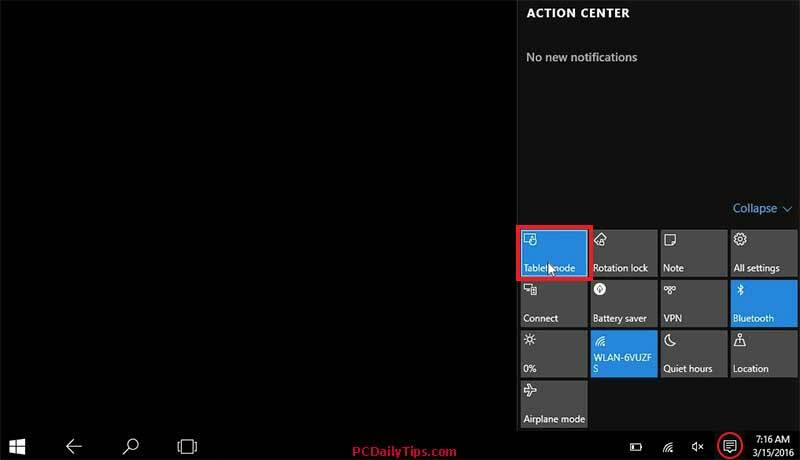 If for example, you decide, and you want that your device, to only use Tablet mode or Desktop mode only whenever you switch your device on, you can set this up, in Win 10 settings. 1. Go to “Settings” by pressing your Windows key, then “Settings”. 4. On and Off button. Additionally, you can set the options, on the “When I sign in” options, and other options as well. You can alter them as your liking and preferences.